We haven't really had much to update on THQ Nordic's Biomutant since Gamescom earlier this year. However, today IGN posted a couple minutes of new footage in one of their 'IGN First' videos, showcasing some of the game's locations and a few characters. It's not a whole lot, but as 2018 comes to a close, it'll be interesting to see if this is the very start of a bit of a marketing ramp as we approach one of 2019s more unique RPG releases. Biomutant is currently under development at Experiment 101, a Sweedish studio comprised of ex-Avalanche developers that was founded in 2015. 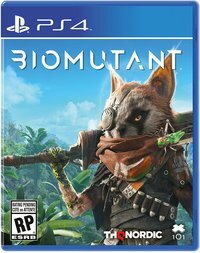 Biomutant is scheduled to release sometime next Summer.